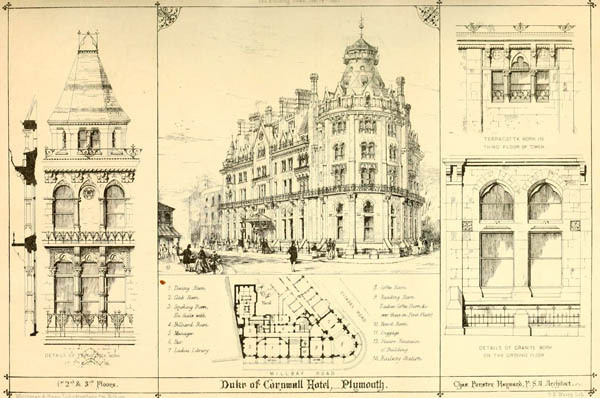 “The building of which we give illustrations (to be called ” The Duke of Cornwall Hotel”) is about to be erected at Plymouth, for the Plymouth Hotel Company, on a large space of ground recently occupied by private houses, and exactly opposite the railway terminus in Millbay road, at its junction with the Citadel-road. Occasion has been taken to improve the five important streets meeting at this point by widening the roadway of each; improvements not easy to effect considering that the concurrence of three distinct corporate bodies besides the authorities at the Admiralty had to be obtained. To those who do not know the locality, we may observe that the Citadel-road leads to “The Hoe,” one of the most remarkable public parks in this kingdom, comprising a fine combination of sea and land scenery, the eye ranging over the whole harbour, far out to sea beyond the Breakwater, and enjoying at the same time the landscape of Mount Edgecombe and the adjoining slopes as well as of the towns. From the plan it will be seen the hotel comprises a large and lofty coffee-room, dining-room, smoking and club-rooms, on the ground-floor, and the usual necessary arrangements for the manager, bar, porter, telegraph, luggage lift, &c, &c.
and bed rooms, with bath-rooms and other conveniences on each floor. These have been arranged for the accommodation not only of families and persons occupying several rooms, but also for gentlemen requiring but one apartment to themselves. At present it is intended to erect only a portion of the general plan, but this includes all the principal apartments. When, however, the whole is completed, it will contain upwards of 200 rooms. 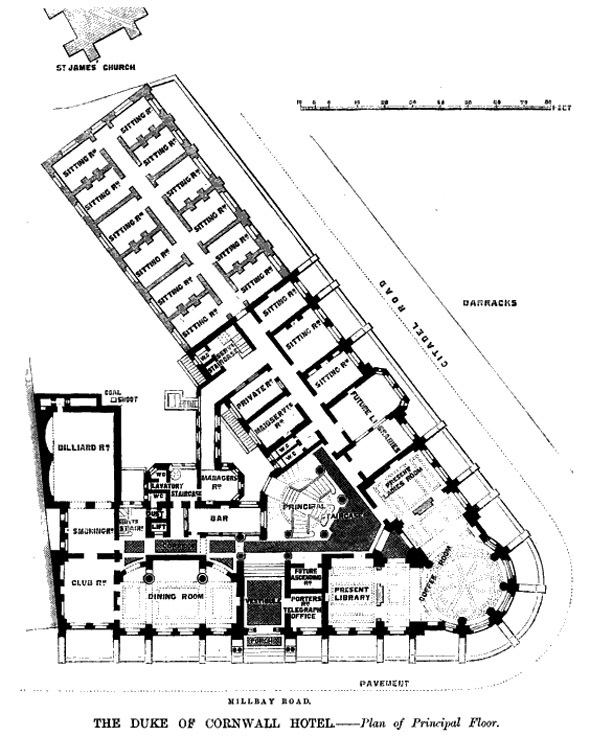 The chief peculiarity in the plan seems to be the staircase, which is circular, and is placed in the inner angle of the corner, the most central part of the building, and at the same time close to the entrance, the lift or ascending-room, the coffee room, and the wing of private apartments to be erected hereafter. The stairs are to be constructed of Portland stone, carried on wrought-iron strings, which are to be visible so as to form part of the constructive decoration of the building. The general system of internal decoration, if decoration it may be called, is to be extremely simple but substantial, inasmuch as the girders which carry the floors [in the coffee-room, &c.], are to be visible, and form in themselves the panelling of the ceilings, while the cornices, window-frames, and so on, are to be wrought in a manner to correspond with them. It would be desirable, perhaps, to add a little colour to this, lest the work should appear too heavy or massive for the purpose intended; but this will probably be done at some later period,””the great object at present being to supply, as soon as possible. sible, the want of first-class accommodation. Of the exterior elevation our readers may judge from the engraving. The windows, placed as they are in groups, with the circular turret, and the tower-like erection at the angle of the building, give a play of light and shade, in place of the warehouse or cotton-mill character sometimes seen in these buildings of many windows, while the unbroken line of balcony on the first-floor serves to unite the whole. The dressings of the windows are of Plymouth limestone, without any mouldings whatever: the window heads are of Tamar granite. It was intended to use terracotta for certain parts, such as chimney shafts, &c.; but this has been abandoned owing to motives of economy. The architect is Mr. C. Forster Hayward, of London. The contract for the execution of the works has been taken by Messrs. Call & Pethick, of Plymouth.” From The Builder, July 4 1863.